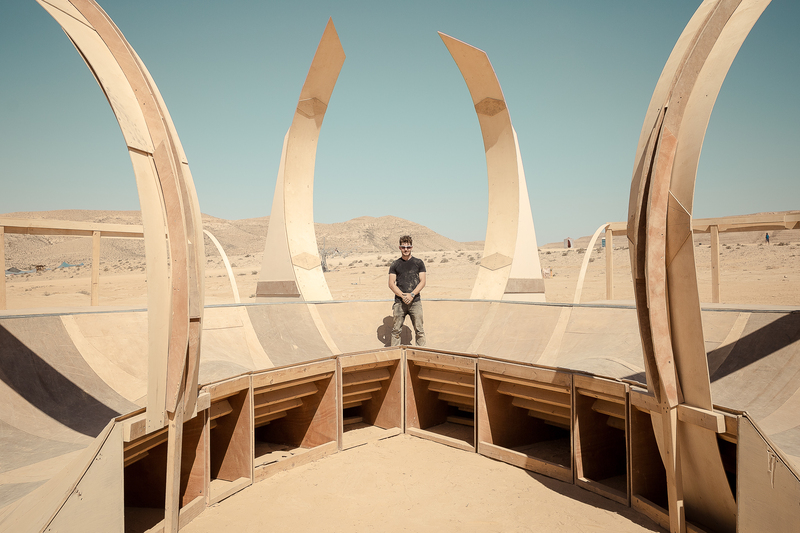 This is the story of Rick Munitz, an Australian industrial designer based in Israel who went to the desert to build a skatepark for Midburn, the Israeli Burning Man in May 2017. With the help of a small grant and a team of volunteers he crafted an 18 meters long 12 meters wide elliptical skating track, which allowed riders from all aged to ride in the desert continually without stopping. From the 87 arts installations, the project of Rick was by far the most interactive. 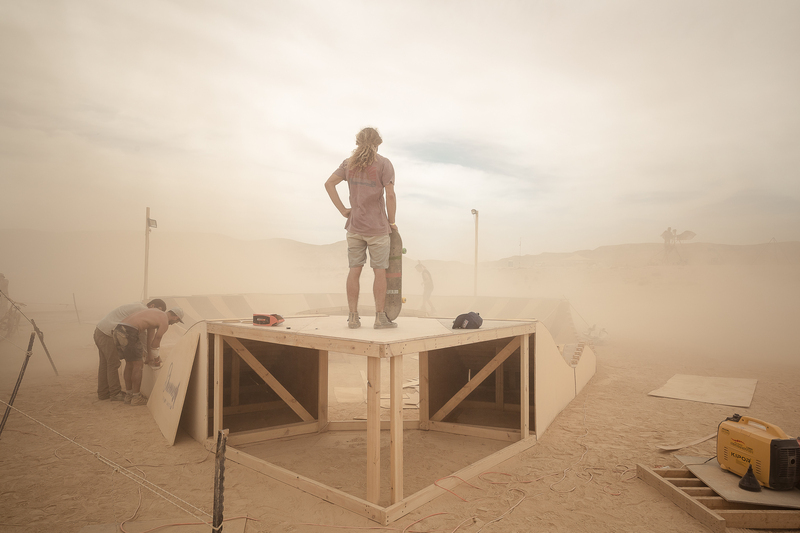 With over 10 500 participants, Midburn has become over the years one of the biggest regional event within the Burning Man culture. 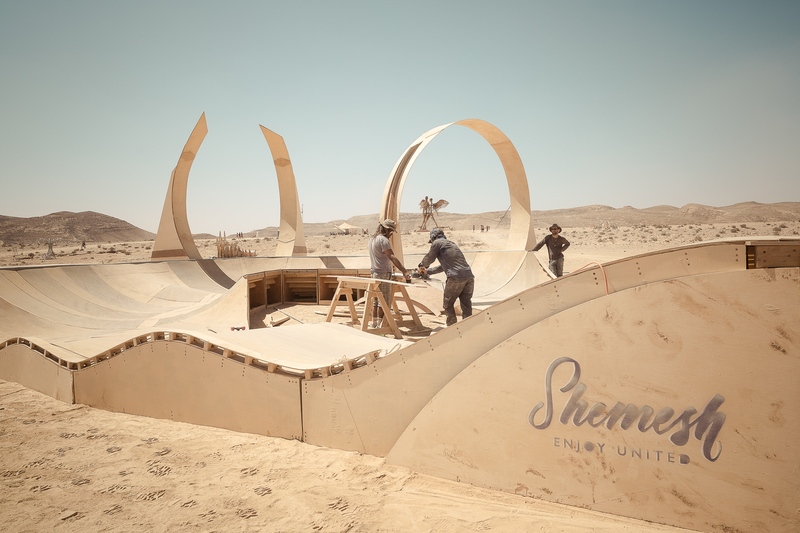 The skatepark called Shemesh (from the hebrew word “Sun”) is inspired by the sun which represents the female force. The lips are massive braking waves of wood and the critical bowl section is covered in a huge peaking wave. From the inside, it should look like braking waves in the ocean and the riders glide around on what looks like a liquid surface. What was the vision for this project ? The vision was to create a lucid dream experience. 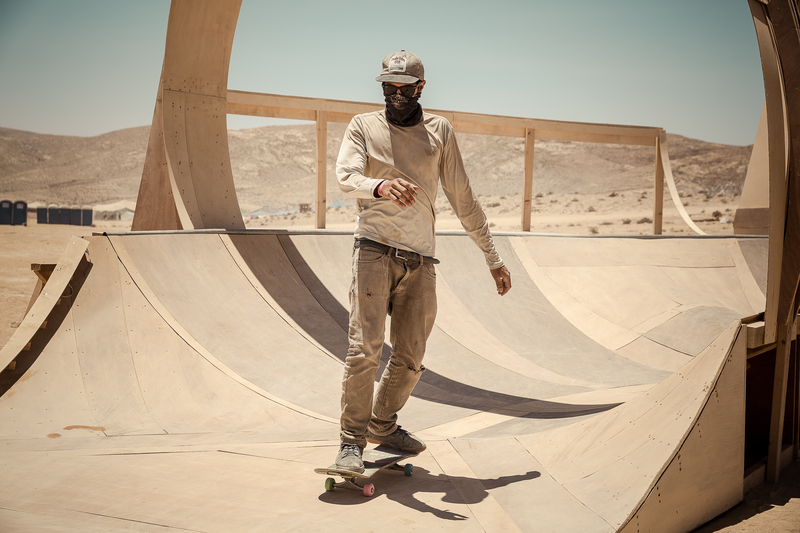 Gliding unassisted through the desert, bringing together the art performance of skateboarding with the fine art of ramp building. 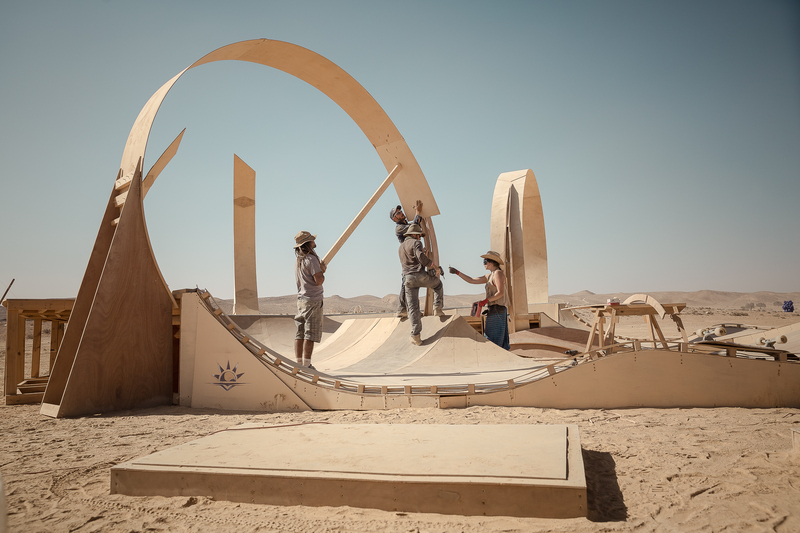 Midburn offered me an amazing canvas to be as creatively radical as possible. Is Shemesh the very first skatepark ever build in the desert ? As far as I know it could be, people have skated in the desert before but I don’t believe on this scale and level in Israel. 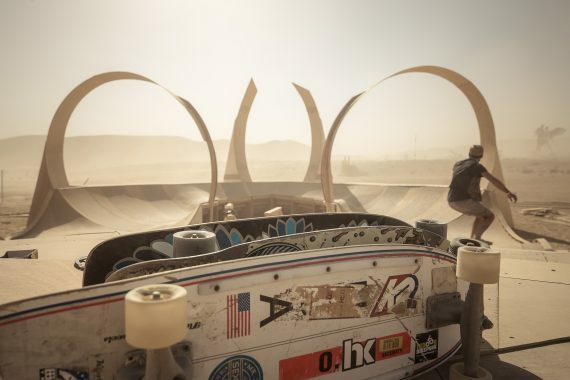 Burning man has a skate camp and have also encouraged personal skating projects at the event. 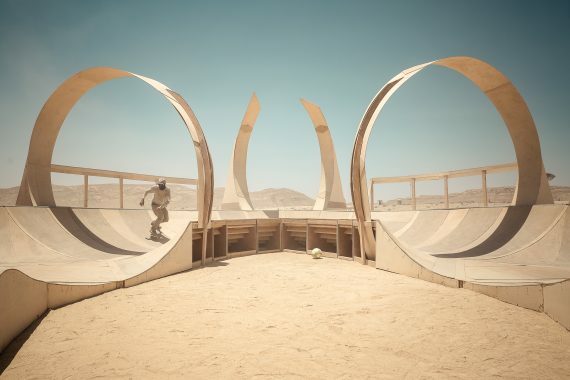 In what way the Midburn platform was so different from the city environment for the riding experience ? The riding experience at Midburn was challenging, as the desert dust got into the bearings of the wheels and on the track creating a lack of friction which was thrilling sometimes. In terms of the people, it was extraordinary. The riders and audience become synchronized in exhilaration, so the excitement and joy was shared. Have you been surprise by the interactions with the public ? Did you expect them ? Can you describe one maybe ? 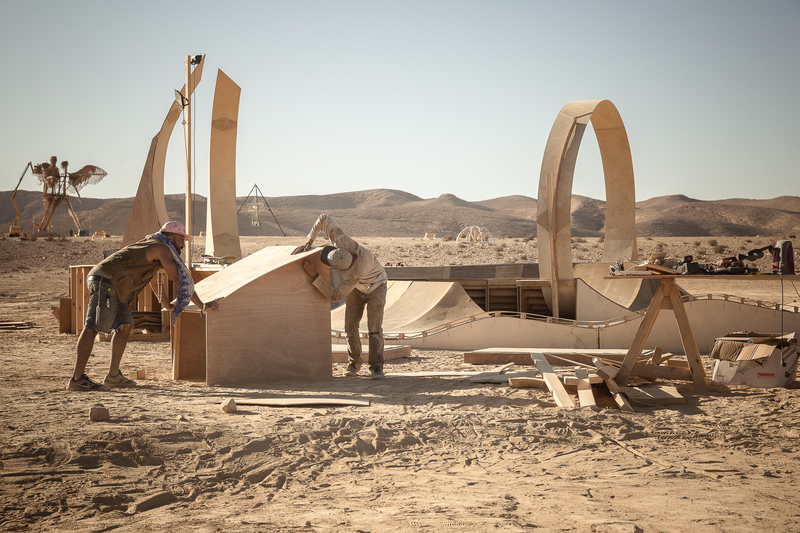 Skateboarding new objects and locations is what skaters strive for, being able to build something like this for skaters was a real challenge. Skating can be highly addictive and I knew if we build it they would come, and they did right on cue. One of the most special interactions I had was with a father of a young rider. He thanked me very warmly saying “I was nervous to bring my kid to Midburn but your ramp has allowed him to express his passion”. What happen with the skatepark after the event ? 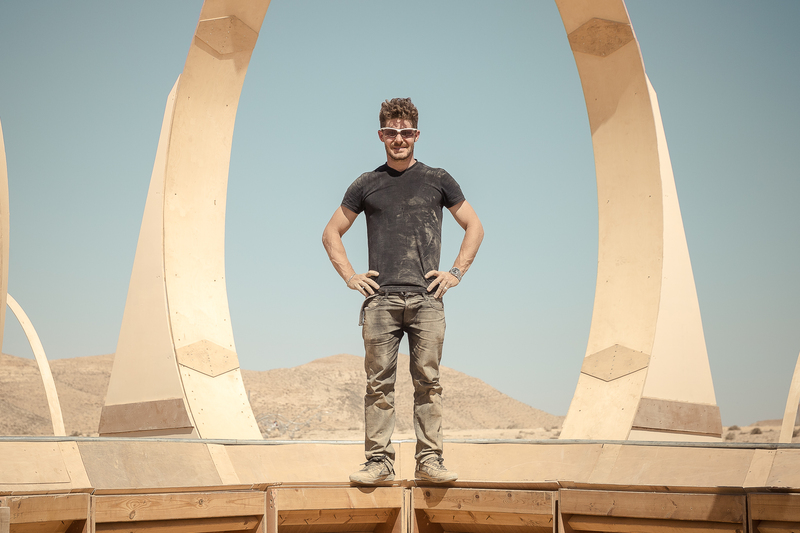 After the event, the ramp has been divided into four separate pieces and gifted to four communities around Israel and the West Bank : Beit ha shanti in the Negev, Kibbutz Ga’ash, a Bedouin village and to a public park in Ramallah. They will be rideable mini-ramps which will give youths the opportunity to express themselves through skating. Otherwise, I am still available for new assignments, anywhere, anytime.